Summary: Researchers used brain scans to predict how young children learn to read, giving clinicians a possible tool to spot children with dyslexia and other reading difficulties before they experience reading challenges. 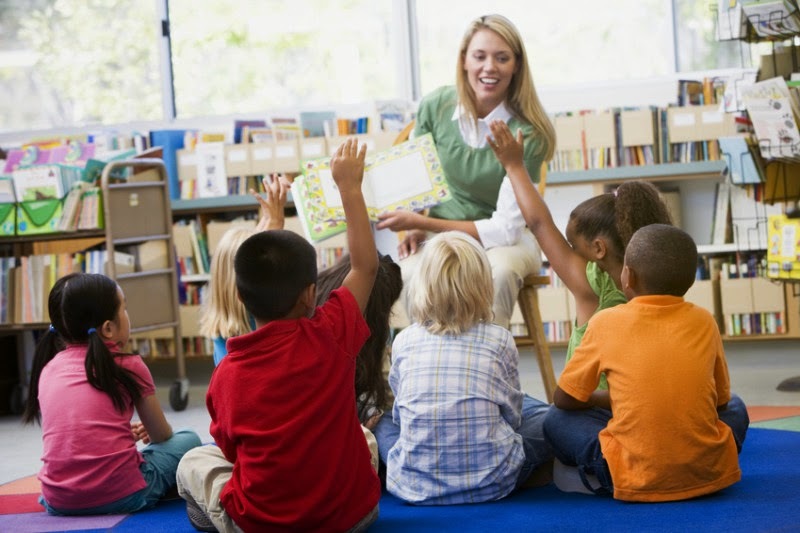 Kindergarten teacher reading to children (stock image). UC San Francisco researchers have used brain scans to predict how young children learn to read, giving clinicians a possible tool to spot children with dyslexia and other reading difficulties before they experience reading challenges. In the United States, children usually learn to read for the first time in kindergarten and become proficient readers by third grade, according to the authors. In the study, researchers examined brain scans of 38 kindergarteners as they were learning to read formally at school and tracked their white matter development until third grade. The brain's white matter is essential for perceiving, thinking and learning. The researchers found that the developmental course of the children's white matter volume predicted the kindergarteners' abilities to read. "We show that white matter development during a critical period in a child's life, when they start school and learn to read for the very first time, predicts how well the child ends up reading," said Fumiko Hoeft, MD, PhD, senior author and an associate professor of child and adolescent psychiatry at UCSF, and member of the UCSF Dyslexia Center. The research is published online in Psychological Science. Doctors commonly use behavioral measures of reading readiness for assessments of ability. Other measures such as cognitive (i.e. IQ) ability, early linguistic skills, measures of the environment such as socio-economic status, and whether there is a family member with reading problems or dyslexia are all common early factors used to assess risk of developing reading difficulties. "What was intriguing in this study was that brain development in regions important to reading predicted above and beyond all of these measures," said Hoeft. The researchers removed the effects of these commonly used assessments when doing the statistical analyses in order to assess how the white matter directly predicted future reading ability. They found that left hemisphere white matter in the temporo-parietal region just behind and above the left ear -- thought to be important for language, reading and speech -- was highly predictive of reading acquisition beyond effects of genetic predisposition, cognitive abilities, and environment at the outset of kindergarten. Brain scans improved prediction accuracy by 60 percent compared to traditional assessments alone. "Early identification and interventions are extremely important in children with dyslexia as well as most neurodevelopmental disorders," said Hoeft. "Accumulation of research evidence such as ours may one day help us identify kids who might be at risk for dyslexia, rather than waiting for children to become poor readers and experience failure." According to the National Institute of Child and Human Development, as many as 15 percent of Americans have major trouble reading. "Examining developmental changes in the brain over a critical period of reading appears to be a unique sensitive measure of variation and may add insight to our understanding of reading development in ways that brain data from one time point, and behavioral and environmental measures, cannot," said Chelsea Myers, B.S., lead author and lab manager in UCSF's Laboratory for Educational NeuroScience. "The hope is that understanding each child's neurocognitive profiles will help educators provide targeted and personalized education and intervention, particularly in those with special needs."